We designed the Mount Diablo Active Compression Calf Sleeves to help reduce muscle vibration and prevent swelling, the perfect combination to minimize muscle injury and soreness. You can wear our calf sleeves every day for any workout or high intensity fitness activities. 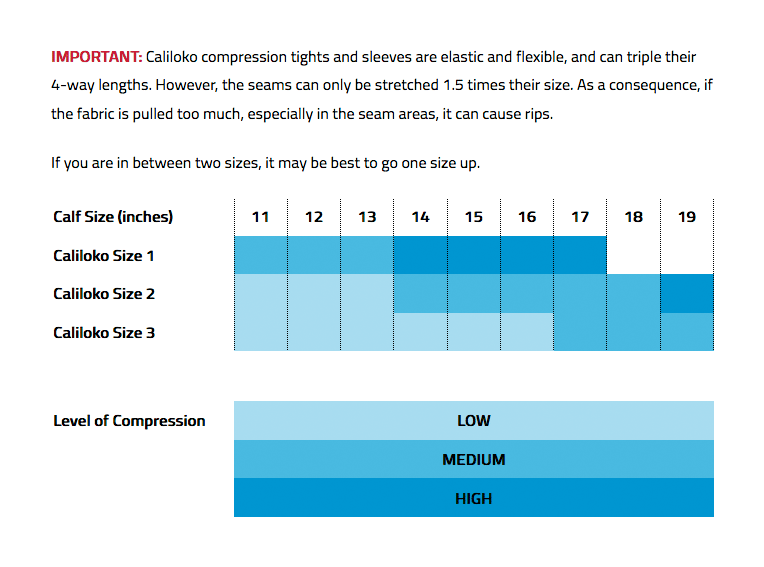 Caliloko’s compression technology fabrics feel tighter than other sportswear. Our 4-way stretch knitted fabrics are finished by hand and delicate. To avoid any ripping when you put on the calf sleeves, it is recommended to carefully pull on the fabric one hand length at a time.Our sizing charts are meant to guide you while you select the appropriate size that you wish to purchase. Please know that if you desire more compression, you simply choose a size down, if you are looking for less compression, you simply choose a size up. It all depends on your athletic goals and the feeling of compression that you want.